Have you ever considered what type of information trail you might be leaving about yourself in cyberspace? In today’s connected world, your digital footprint is out there for everyone to check out, and many do not realize its importance. We have all heard the crazy stories of photos portraying gross indiscretions being posted on the web and people getting fired as a result. Or you may be following the news about prospective employers requiring that they be given Facebook access to the accounts of those they are considering hiring. While these examples get everyone’s attention, consider the less sensational implications of one’s digital footprint that occur on every day. • An internal company recruiter searches the name of a prospective employee and finds that they are a member of an activist group that is contrary their beliefs, so declines to interview them. • A person searches the name of a prospective first date and rules them out in moments due to their excessive activity commenting on a sports blog. • Someone’s comments from years ago are discovered and prevent them from moving forward for political office. • An employee finds that their boss is a huge donor to a cause that they are directly opposed to and starts looking for another job. The list of scenarios could go on forever, and they are happening daily. Really, who can blame people for using the information that is out there to gain a deeper understanding of those they intend to engage with. As an employer, it only makes sense to check the web out before hiring. As a salesperson, it is considered due diligence to thoroughly search the digital footprint of someone you are about to meet. 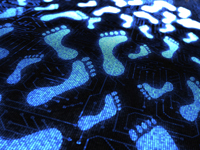 How can you safeguard your digital footprint? 1. Recognize that everything you post, even in a private area may become public at some point. 2. Use great care in commenting on discussions of religion, politics, and personal matters. You may be okay with your comments being public now, but your opinions and position are likely to change. 3. If you were having a conversation with your mom, teacher or mentor in the room, would you use that language? Enough said. 4. If your comments are directed at another person or group, consider what you would say and how you would say it if they were in the room. 6. Most importantly, consider who you are and who you want to be, and insure that you are leaving a good footprint. Non-existent or vanilla and boring isn’t necessarily good either. Considering your digital footprint is important, and makes one consider their legacy as a whole. Your digital footprint can be a positive and tell the right story about a quality leader and who serves others and impacts their community for good. Leave an imprint for good!